I’ve been a knitter all of my life and I am always looking for ways to create that same look with beads. This stitch looks just like a knitted wishbone cable stitch but I promise you it is all done with beadwork. Learn to twist the beads using Ndebele techniques. Also included are diagrams for four different ways to twist the beads for four really different looks. A little Ndebele experience will be helpful. She clasp in the kit is 2mm wider than the one I used on my sample. It looks really similar, though. I know you will be happy with it. Learning how to use a kumihimo disk is great fun. 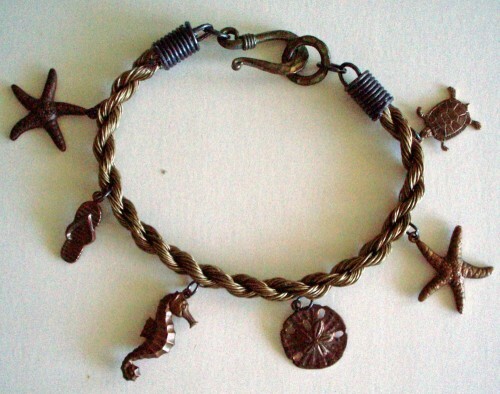 It will enable you to make this twisted spiral using Soft Flex wire bracelet. It is the only way to achieve this effect. You will also learn how to make the attached twisted end caps. What makes this piece especially appealing is that, once learned, you can make more and attach all those special items in your stash that you’ve just been waiting to show off. Making this spiral as a longer piece for a necklace will be the perfect spiral upon which to hang all the wonderful pendants that you have made in classes or those that you have purchased. In any event it is a great technique to add to your repertoire. And now it's your turn to be like Sarah Jessica Parker...only you'll be wearing your Manolo’s on your wrist. You can make as many as you like and they won't cost thousands of dollars. They can be designed in many ways, from flip-flop sandals to drop-dead heels, and they can be made in any combination of colors. You will learn how to make the graduating colors bracelet which is a great way to show off all of your Manolo’s. You will also learn even-count peyote stitch and brick stitch...all while you add to your shoe collection. 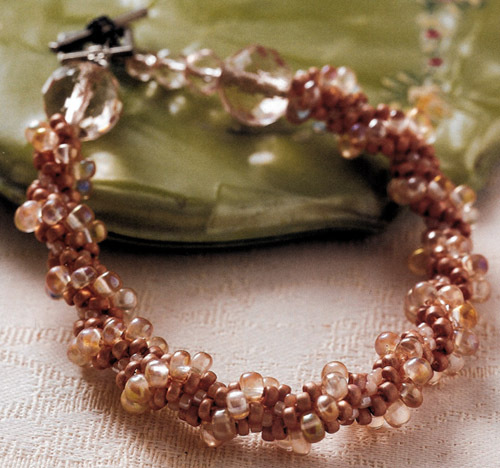 Using three different size beads you will learn to produce a most attractive bracelet. The spiraling pattern and the overall chunky effect make it a most unique accessory. But, perhaps most important, this crochet rope is so very simple to make that it’s an excellent starter project for the new beader. You need to know only two stitches – chain stitch and slip stitch – to create a truly stunning piece. I made the video shown below for a friend and customer in Wales. I do think you will find it most helpful. As a demonstration tool I used two colors of larger beads to show the technique. If you are having difficulty with the rope I would suggest that you do the same and practice just a bit. Additional Supplies Required: Small sharp scissors, Fray Check, Size 14 crochet hook. Seaside Daisies grow along the lush, dark green, creeping vines that cover the California coastal dunes. 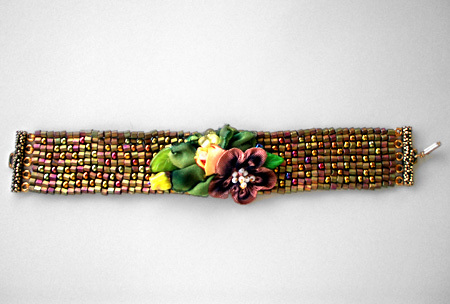 This Seaside Daisy patterned bracelet is an exercise in peyote stitch beading and in following a peyote stitch graph. The kit also includes instructions for the wonderful spiky flowers and several fringing techniques. 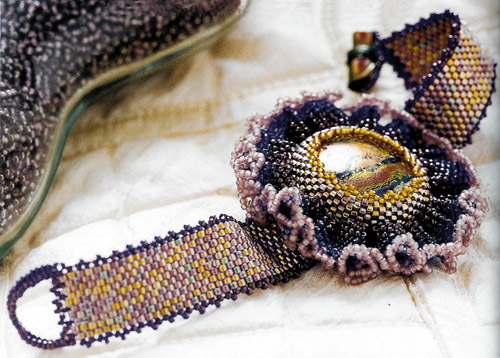 Learn how to capture a cabochon using delica beads in conjunction with Size 15 beads and also how to make a beautiful bead ruffle. No glue or leather is used in this process. The cabochon in the kit is a hand-selected piece of dichroic glass. I have chosen the size 15 beads for the ruffle so as to perfectly compliment the cabochon. This is an intermediate level project. Many people believe that there are only two ways to insure 4 straight sides in beadwork, looming and square stitch. This is simply not true. Here is another way that will be a great stitch to add to your repertoire. This stitch is called Mosaic Stitch and since the holes will be going opposite of the previously mentioned techniques you will find this to a very useful stitch, indeed. What I present here is a new way of working that will produce not only straighter rows but a more stable result overall and the end result will be a fabulous bracelet which includes an interesting spiky flower, as well. As taught at the Bead and Button Show in Milwaukee. 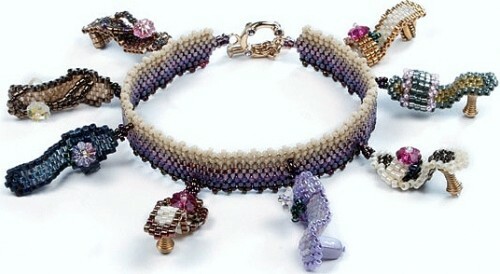 This class was sold out at Bead and Button but now you can buy the kit. The fantastic stitch is Mosaic Stitch. This stitch is most unique and quick. There are ribbon embellishments that finish off this beautiful bracelet. Many people believe that there are only two ways to insure 4 straight sides in beadwork, looming and square stitch. This is simply not true. Here is another way that will be a great stitch to add to your repertoire. This stitch is called Mosaic Stitch and since the holes will be going opposite of the previously mentioned techniques you will find this to a very useful stitch, indeed. What I present here is a new way of working that will produce not only straighter rows but a more stable result overall and the end result will be a fabulous bracelet which includes the inovative Star Shine flowers, as well. The Star Shine flowers are made using 3 different sizes of Delica beads by Miyuki. 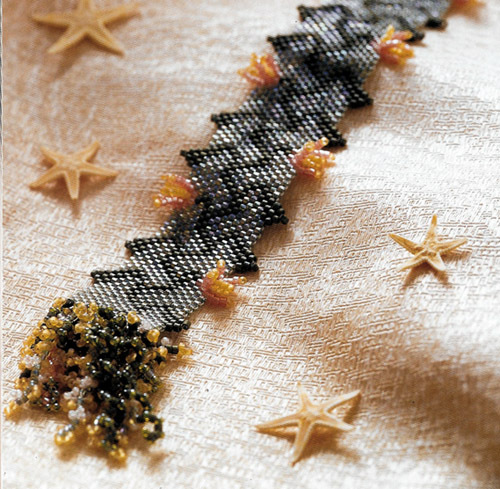 This project is just like the Star Shine Shown above but uses 2 sizes of Delica beads PLUS three wonderful lamp work flower beads. Many people believe that there are only two ways to insure 4 straight sides in beadwork, looming and square stitch. This is simply not true. Here is another way that will be a great stitch to add to your repertoire. This stitch is called Mosaic Stitch and since the holes will be going opposite of the previously mentioned techniques you will find this to a very useful stitch, indeed. What I present here is a new way of working that will produce not only straighter rows but a more stable result overall and the end result will be a fabulous bracelet which includes the inovative Star Shine flowers, as well. I call this technique "Speedy Looming" because that's exactly what it is. Beads are placed onto the warp threads before the loom is dressed and that's what allows you to move along very quickly. Learn the technique of looming a row and then bringing in a bead from the warp threads. The process is twice as fast as normal looming and twice as sparkly since the beads end up in two different directions. How good is that? The bonus on this project is that the bracelet can be worn with two completely different looks. 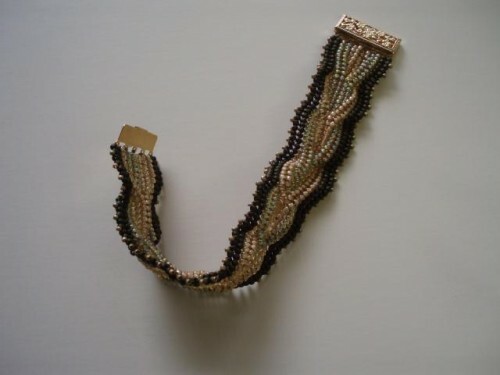 Wear it with two twisted strips of beadwork in the center or twist it once again to look like a braid. The kit is packed with a beautiful clasp. This photo shows both ways to wear this bracelet. This is a Delica bead looming project. 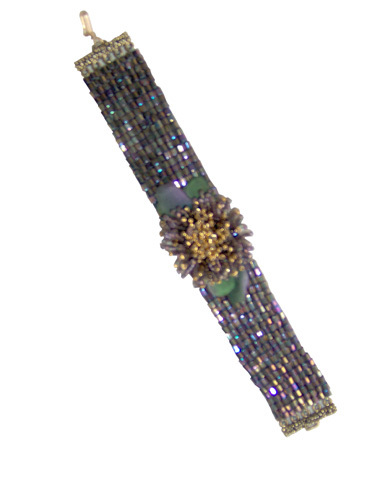 This bracelet is made using five colors of Delica beads. During the process of making this bracelet, you will learn how to set up the loom how to hide the ends once your bracelet is completed. This is a most delicate looking bracelet that I'm certain you will enjoy for many years to come. So what makes the Mystery Bracelet a "mystery" you ask? Like any good puzzle, you'll have to wait until the end of the looming process for the answer.